Located 67 miles (108 km) west of Key West, Florida, Dry Tortugas National Park is one of the most remote national parks in the United States. Visitors can only access the park via boat, seaplane, or aboard the official Dry Tortugas National Park ferry. Dry Tortugas National Park encompasses a seven-island archipelago known for its spectacular reefs and marine life. The islands are home to Dry Tortugas National Park, and are accessible only by boat or seaplane. The large seabird colony, including sooty terns, brown noddy, masked booby and magnificent frigatebird, and the regular occurrence of Caribbean vagrant birds makes them a popular birding destination. The keys are low and irregular. Some keys have thin growths of mangroves, and various other vegetation, while others have only small patches of grass, or are devoid of plant life. In general, they rise abruptly from relatively deep water. They are continually changing in size and shape. The Tortugas Atoll has had up to 11 and as few as five during the past two centuries. Some of the smaller islands have disappeared and reappeared multiple times as a result of natural geomorphology and the impacts from hurricanes or other tropical storms. The total area of the islets, some of which are little more than sand bars just above the water mark, is about 580,000 square meters (143 acres). Their area changes over time as wind and waves reshape them. Currently there are seven keys. These seven small islands are constantly changing. Thy are composed of carbonate sand and smaller amounts of coral rubble, with the exception of Loggerhead Key, which contains the most extensive occurrence of beachrock in south Florida. Carbonate sands and, to a lesser extent, coral rubble are easily transported by wind and water, especially during tropical storms and hurricanes. The size, shape, and location of the islands are constantly changing, sometimes rapidly. During a 4-month period in 2005, four hurricanes impacted the park. Tropical storms and hurricanes change the shape of the islands, create and destroy channels between islands, and sometimes cause islands to disappear completely. For example, a land bridge made of sand intermittently joins Bush Key and Garden Key. In general, sediment transport is to the west and Bush Key has been slowly migrating closer to Garden Key. Over time, however, storms and hurricanes have interrupted this overall trend. These shoreline changes affect the ecosystems in the park, facilities on the islands (particularly on Garden Key), and accessibility. Loggerhead Key, 250 by 1,200 m (820 by 3,940 ft) in size, with an area of 260,000 m2 (64 acres) is the largest. This island has the highest elevation in the Dry Tortugas, at 10 feet (3.0 m). The Dry Tortugas lighthouse, 46 m (151 ft) 46 meters high, is on this island. Garden Key, with Fort Jefferson and the historic Tortugas Harbor Light (20 m (66 ft)). It is 4 km (2.5 mi) east of Loggerhead Key. Garden Key is the second largest island in the chain, at 400 by 500 m (1,300 by 1,600 ft) in size, with an area of 170,000 m2 (42 acres). The original size, before construction of Fort Jefferson, has been estimated at 30,350 to 35,610 m2 (7.50 to 8.80 acres). Bush Key, formerly named Hog Island because of the hogs that were raised there to provide fresh meat for the prisoners at Fort Jefferson, just a few meters east of Garden Key. At times, Bush Key is connected to Garden Key by a sandbar. The island is the third largest, 150 by 900 m (490 by 2,950 ft), area 120,000 m2 (30 acres), less than 1 m (3 ft 3 in) high. Bush Key is the site of a large tern rookery. It is closed to visitors from April to September to protect nesting sooty terns and brown noddies. Long Key, 59 m (194 ft) south of the eastern end of Bush Key, 50 by 200 m (160 by 660 ft) in size, area of 8,000 m2 (2.0 acres). Hospital Key, so called because a hospital for the sick of Fort Jefferson had been built there in the 1870s. The island was formerly called Middle Key or Sand Key. It lies 2.5 km (1.6 mi) northeast of Garden Key and Bush Key, 70 m (230 ft), area 4,000 m2 (0.99 acres), and is 1 m (3 ft 3 in)high at its highest point. Middle Key, 2.5 km (1.6 mi) east of Hospital key, 90 m (300 ft), area 6,000 m2 (1.5 acres), due to various seasonal changes, storm patterns and tidal cycles it is not always above sea level, disappearing for weeks or months only to reappear again. East Key, 2 km (1.2 mi) east of Middle Key, 100 by 200 m (330 by 660 ft), area 16,000 m2 (4.0 acres), over 2 meters high. The three westernmost keys, which are also the three largest keys (Loggerhead Key, Garden Key, and Bush Key), make up about 93 percent of the total land area of the group. 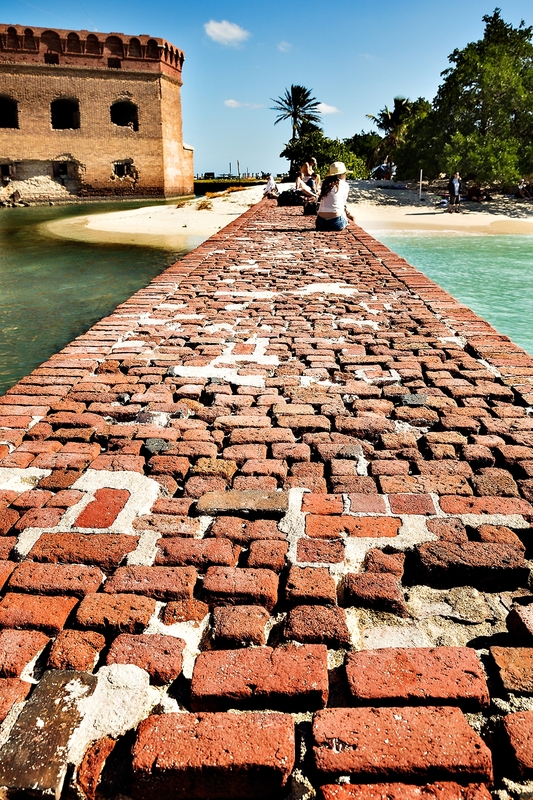 The first European to see the Dry Tortugas was Juan Ponce de León, who visited on June 21, 1513. Ponce de León caught 160 sea turtles there and subsequently referred to the islands as “Las tortugas” (the turtles). They term dry was added later to warn mariners to the absence of surface fresh water on the island. The archipelago includes a high concentration of historically significant shipwrecks dating from the 17th century to the present. 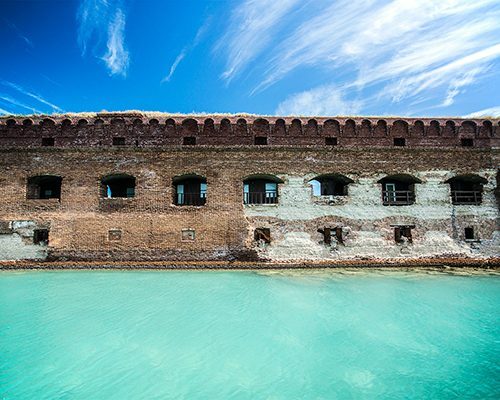 The Dry Tortugas were a significant American naval base from colonial times to the early 20th century, providing a sheltered anchorage and coaling station through the Spanish–American War. Work was half complete in 1860. Construction continued into the American Civil War, but eventually stopped, and the fort was used as a military prison. It was here that Dr. Samuel Mudd and three others charged with conspiracy in the assassination of President Abraham Lincoln were imprisoned. Mudd was pardoned in 1869 after averting a viral outbreak. This use as a military prison continued until 1874. With the introduction of coal-fueled ships, the Dry Tortugas became a coaling station for U.S. Navy ships. 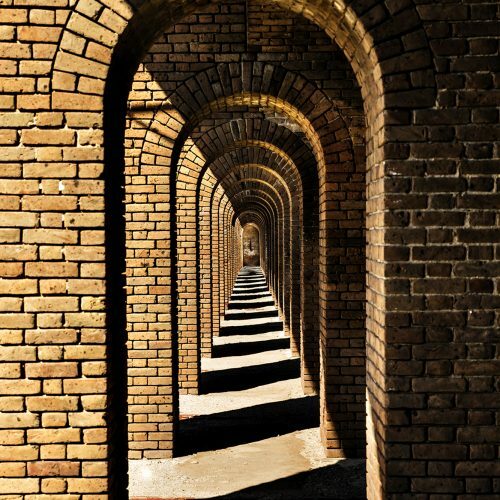 The United States government never completed Fort Jefferson after 30 years on Garden Key. This bastion remained in Union hands throughout the Civil War. It later was used as a prison until abandoned in 1874. Dr. Samuel Mudd, famous for being the doctor who treated John Wilkes Booth in the wake of the Lincoln assassination, was imprisoned here until early 1869. 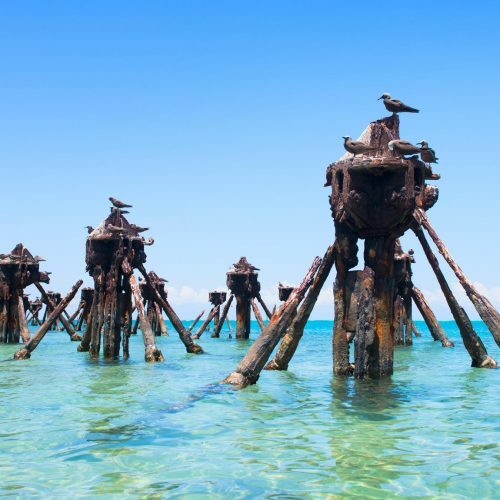 During the 1880s, the Navy established a base in the Dry Tortugas, and it subsequently set up a coaling (refueling) and a wireless (radio) station there as well. During World War I, a seaplane base was established in the islands, but it was abandoned soon thereafter. From 1903 until 1939 the Carnegie Institution of Washington operated the Marine Biology Laboratory on Loggerhead Key which “…quickly became the best-equipped marine biological station in the tropical world.” Through the years, over 150 researchers used the facilities to perform a wide range of research. In June 1911 the laboratory built a vessel in Miami, Anton Dohrn, for use by researchers as well as logistics between the station and Key West. The vessel, except in a period of World War I service with the Navy, supported the laboratory’s work until closure in 1939 and donation of Anton Dohrn to the Woods Hole Oceanographic Institution. An account of a visit to the fort at the Dry Tortugas by President Franklin D. Roosevelt and Justice-to-be Robert H. Jackson can be found in Jackson’s book That Man: An Insider’s Portrait of Franklin D. Roosevelt. 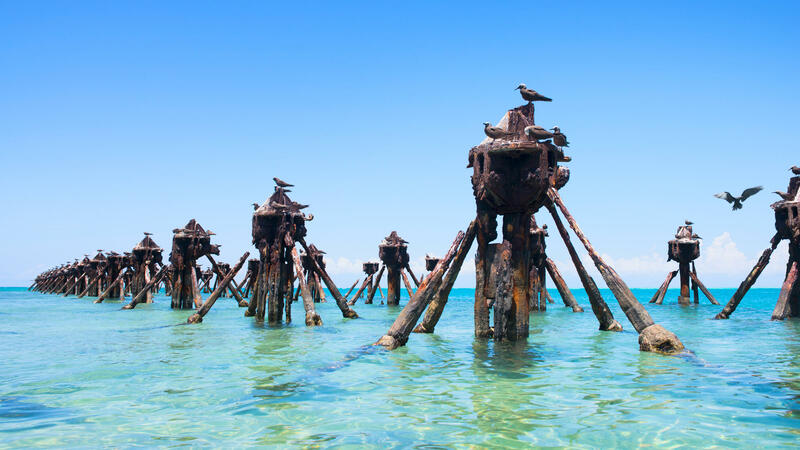 The Dry Tortugas are also rich in maritime history.The shallow waters of the Tortugas and the difficult navigational hazards presented by the native reefs contributed to this park being one of the large ship graveyards in the country. The park protects these submerged cultural resources for current and future generations with documentation and educational outreach. There are multiple sites within the park boundary that are excellent for diving and snorkeling. In August 2004, the Dry Tortugas were directly struck by Hurricane Charley. The following day, a Cessna airplane crashed into the water near the islands, killing cinematographer Neal Fredericks while he was filming scenery for the feature film CrossBones. Fort Jefferson is a massive but unfinished coastal fortress. It is the most ambitions coastal fortification in the United States. 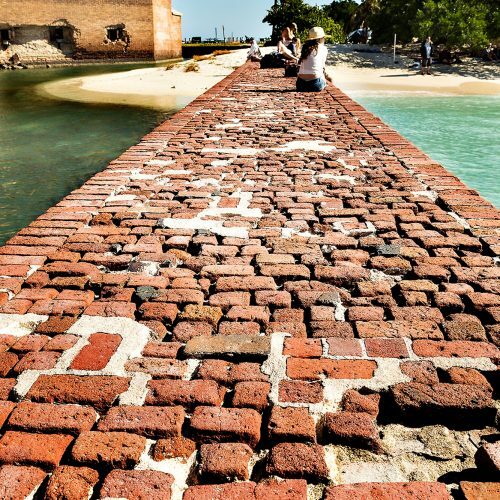 ,Composed of unreinforced coral concreted and faced with more than 16 million bricks Fort Jefferson has an impressive aesthetic highlighted with 1000s of arches. 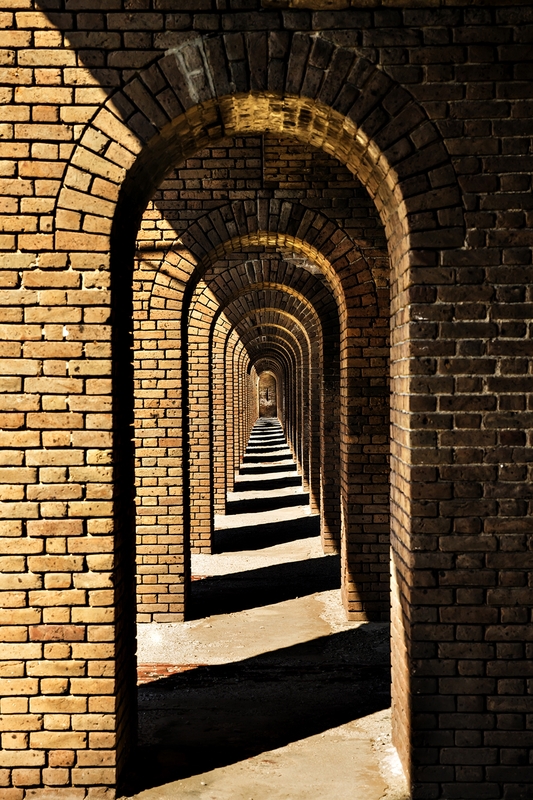 Comprising 47,125 acres (19,071 ha), Fort Jefferson National Monument was designated by President Franklin D. Roosevelt under the Antiquities Act on January 4, 1935. The monument was expanded in 1983 and redesignated as Dry Tortugas National Park on October 26, 1992, by an act of Congress. Dry Tortugas has a staff stationed at the park and in Key West and receives administrative support and oversight from Everglades National Park. 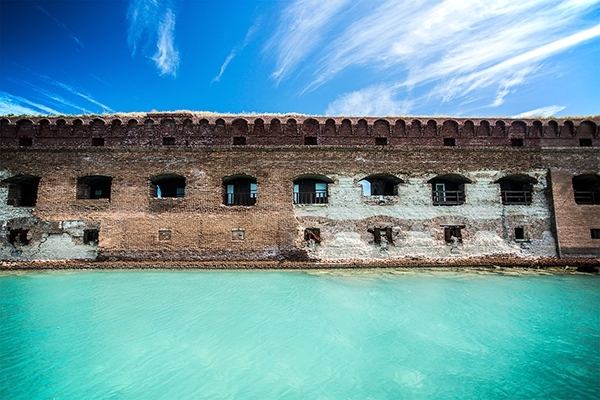 The park was established to protect the island and marine ecosystems of the Dry Tortugas, to preserve Fort Jefferson and submerged cultural resources such as shipwrecks, and to allow for public access in a regulated manner. The park is a landing location for immigrants arriving from Cuba in homebuilt boats called “chugs.” Receiving and housing the migrants is a particular problem for Dry Tortugas, which has limited resources for such arrivals and which is several hours from the nearest Coast Guard or Border Patrol units. 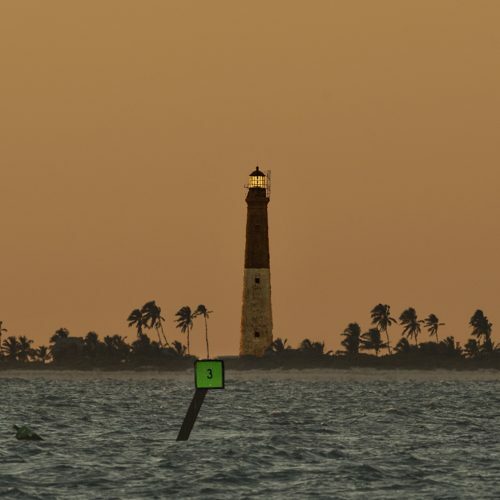 Communications with Key West are accomplished using a satellite-based voice-over-IP system, which is prone to garbling and delays, and by a radio relay system using an abandoned Air Force tower between Key West and the Dry Tortugas. Dry Tortugas National Park is home to many historical and natural wonders above and below the water’s surface. Teeming with life, this area has long been an inspiration to visitors, researchers, and adventurers. The Dry Tortugas archipelago is classified as a borderline subtropical—tropical ecosystem, hosting species that do not normally breed in, and are not commonly found anywhere else within, the continental United States or the islands and waters surrounding it. 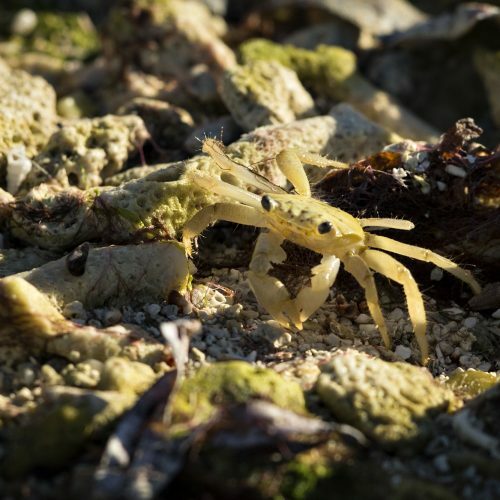 The park’s coral reef and seagrass communities are among the most vibrant in the Florida Keys, providing habitat for myriad species of marine wildlife. The Sooty Tern finds its only regular nesting site in the entire United States on Bush Key, adjacent to Fort Jefferson. Large sea turtles lumber onto the park’s protected beaches to bury their clutches of eggs. Patient visitors who are willing to walk around, get wet and go swimming, snorkeling, or diving will glimpse many animal and floral species in its different topographic variations. Dry Tortugas National Park is near the southwestern edge of the Florida Platform. This broad, flat, carbonate platform is only partially exposed above sea level as the Florida peninsula. The submerged portion of the platform extends to water depths of about 300 feet (90 meters). Beyond this point, the sea floor drops abruptly to more than 10,000 feet (3,000 meters). The Florida Platform has been accumulating sediments since the Atlantic Ocean basin began to form almost 200 million years ago. Carbonate rocks such as limestone and dolomite more than 15,000 feet (5,000 meters) thick make up the platform and underlie Dry Tortugas National Park. These rocks continue to form as the calcareous shells and skeletons of dead sea life are deposited on submerged areas of the platform. During the Pleistocene Epoch (2.6 million–11,700 years ago), sea level rose and fell repeatedly in response to the advance and retreat of continental ice sheets. During an advance, a portion of Earth’s water is stored as glacial ice and sea level falls. During a retreat, the water is released, and sea level rises. During glacial periods, much of the Florida Platform was exposed above sea level and its carbonate bedrock was eroded. During interglacial periods, the Florida Platform was largely submerged and coral reefs established themselves on the outside of the tiny Florida peninsula. As sea level dropped to its current location, the tops of these reefs were exposed and now make up the Florida Keys. Limestone underlies all of the Florida Keys, including Dry Tortugas National Park. The Key Largo Limestone is an exquisitely preserved fossilized coral reef that forms the bedrock directly beneath the more recently deposited sand banks, islands, and reefs of the park. It consists of primarily intact coral heads embedded in a matrix of sand-sized carbonate grains. The coral-head framework functioned as a trap for smaller fragments of coral, coralline algae, and the shells of mollusks and other sea life. The framework corals are mainly star and brain corals. Nearly all of the coral species that are contained in the Key Largo Limestone still exist and currently grow in the modern reefs that are common around south Florida today. The Key Largo Limestone formed in the Pleistocene Epoch during a warm interglacial period between ice ages when sea level was as much as 100 feet (30 meters) higher than it is today. Although the Key Largo Limestone is not exposed at the surface in Dry Tortugas National Park or anywhere near the Lower Keys, it crops out in the Upper and Middle keys. Within the park, the Key Largo Limestone underlies the live reefs and recent sediments. Sediment cores obtained from drilling have revealed its presence at various depths. The upper surface of the Key Largo Limestone is not flat; rather, it shows great topographic variations similar to those of a live reef. These variations are largely responsible for the location of the park’s reefs, sand banks, and islands. More than half the seafloor in the park is covered by recent, unconsolidated sediments. These sediments make up the shallow sand banks. The lack of stabilizing vegetation and coral allows unconsolidated sediments to be easily transported by flowing water. Sand ripples formed by flowing water are common features. The grains that make up the unconsolidated sediments are derived from the same species as those typically found in the underlying and older Key Largo Limestone: primarily particles of calcified algae of the genus Halimeda, along with varying quantities of fragmented coral, mollusk, and foraminifera. Sediment size ranges from gravel to mud. Gravel and sand are common in storm-degraded shoals, sand and silt are common in quieter protected areas, and fine-grained muds are common in the deepest areas. Also known as hardbottom, pavement is a type of flat, low-relief, mostly solid rock substrate that may be overlain by a veneer of unconsolidated sediment. Pavement makes up a very small portion of the sea floor, some of which is occupied by communities of soft corals, such as octocorals. Outside of the park, exposed areas of Key Largo Limestone form pavement, but as previously stated, the Key Largo Limestone does not crop out anywhere in the park. Rather, pavement in the park occurs where sediments have been lithified, or transformed into stone. This hardbottom, non-bedrock seafloor forms where algae or inorganically precipitated calcium carbonate partially cements granular marine sediments together as they accumulate. Paleontological resources are any remains of past life preserved in a geologic context. Fossils are the primary constituent of the bedrock limestone, coral reefs, sandbanks, and islands of the Dry Tortugas. Fossils help to date—in other words, put a geologic age on—the rocks in which they appear. 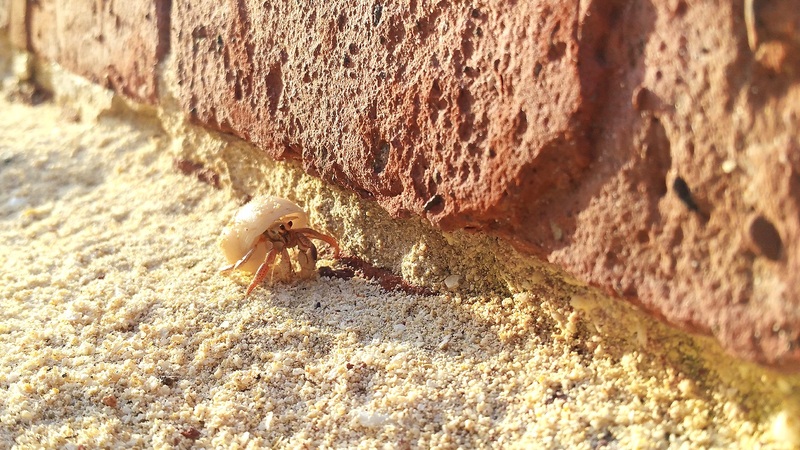 Moreover, marine fossils that are now exposed on land surfaces provide lessons on paleoecology by showing how the environment has changed over time. Fossils that are accessible to visitors on the islands and by snorkeling in the shallow marine areas of the park include corals, mollusks, invertebrates, microfauna, and calcareous algal remains. Loggerhead Key is unique among the islands of the park because it is the only island with outcrops of beachrock, a sedimentary rock that has formed underneath a thin layer of unconsolidated sediments along its shorelines. Beachrock formation typically occurs in the subsurface area between high and low tide where evaporation causes seawater to become supersaturated with calcium carbonate. 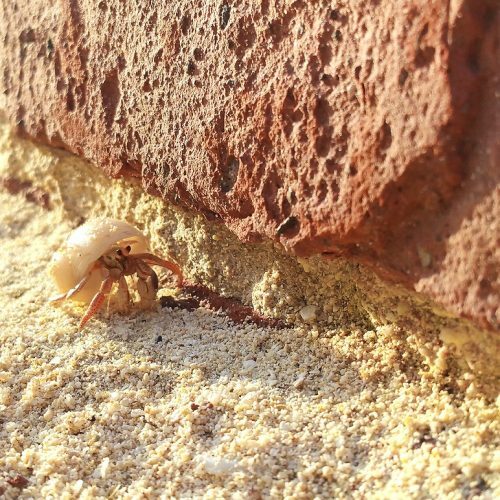 The highly concentrated calcium carbonate contained in such waters cements together shallowly buried beach sediments, such as mollusk shells, coralline algae, coral, and encrusting algal debris, causing them to lithify into stone. Beachrock typically occurs in fractured blocks that are inclined toward the sea. The fracturing, commonly known as jointing, is visible in the Loggerhead Key beachrock deposits. Erosion has widened the joints and caused pitting over the surface of the beachrock. The live coral reefs in Dry Tortugas National Park draw tourists and researchers alike. These pristine, remote reefs have been growing for the past 11,700 years and in some places are more than 50 feet (15 meters) thick. They are home to more than 50 coral species, including the threatened elkhorn (Acropora palmata) and staghorn (Acropora cervicornis) species. Although the reefs in the park may appear stunning in comparison with the more easily accessible reefs along the Florida Keys, their health has been declining since at least the 1980s. Coral disease outbreaks and bleaching are on the rise. Coral reef rehabilitation is a primary concern in the park, and more research is needed to determine the cause of decline in stony coral cover and how to encourage new growth on reefs. In 2007, a no-take, no-anchor Research Natural Area was established in the park to protect marine life and habitats. Baseline data have been established and ongoing monitoring has determined that the Research Natural Area is improving the condition of resources within its boundaries. Seagrass beds play an important role in the geologic process of sedimentation by trapping sands and other fine particles that would otherwise be carried away by wave activity or ocean currents. Seagrass roots and rhizomes also stabilize the seabed. Once established, seagrass beds provide protection to reef communities and shorelines against waves and coastal erosion, which is especially important during the large tropical storms and hurricanes that often threaten Florida. High sedimentation rates in seagrass beds increase water clarity, which is beneficial for coral growth. Many varieties of marine life depend on seagrass. 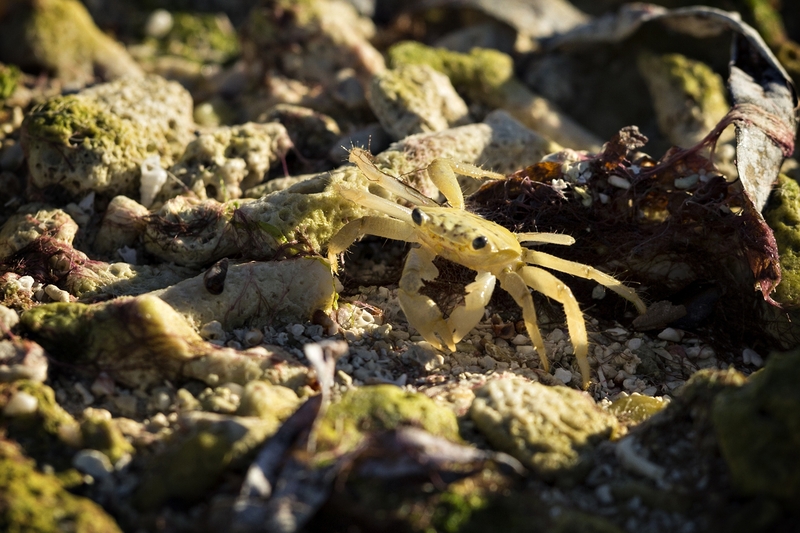 Small organisms find protection from predators and fast-moving currents in seagrass beds and the associated sediment accumulations into which they burrow. Seagrass beds serve as nurseries for juvenile reef fish species and provide a source of food for foraging marine animals. Several seagrass species grow in the park. Turtle grass (Thalassia testudinum) dominates the shallow flats, the deeper grass beds are a mixture of turtle and manatee grass (Syringodium filiforme), and the deepest areas are occupied by tape grass (Halophila spp.). Exotic species are introduced species, which means that they have been imported from elsewhere by humans. Many exotic species do not present a threat to native species, such as tomatoes and avocados, which are cultivated for the benefit of humans and do not become invasive. Only a small percentage of exotic species become invasive by causing harm to native species, posing a threat to human health and safety, or causing economic damage. Invasive exotic (nonnative) plant and animal species threaten the integrity of native communities. Far from their native homelands, nonnative species have a competitive advantage over native species. Because nonnative species typically lack natural predators, they can outcompete native species. They can multiply unchecked, using up valuable resources such as sunlight, water, and nutrients. Native species suffer from this intense competition. In addition to the environmental havoc they wreak, invasive exotic species have major economic impacts. This economic effect is magnified in the state of Florida, where the climate and landscape are favorable to the establishment of invasive species. Despite best efforts, many of the alien invaders on peninsular Florida are impossible to eradicate. Their spread, however, may be controlled by putting a stop to the release of nonnative plants and animals into the wild and by aggressively managing species that are encroaching on natural areas. Consisting of a series of islands, the geographic nature of the Dry Tortugas makes the spread and containment of invasive exotic species more manageable. Although the Dry Tortugas area was designated Fort Jefferson National Monument in 1934, it wasn’t until 1992, when Dry Tortugas National Park was established, that management of invasive exotic plant and animal species became a priority. 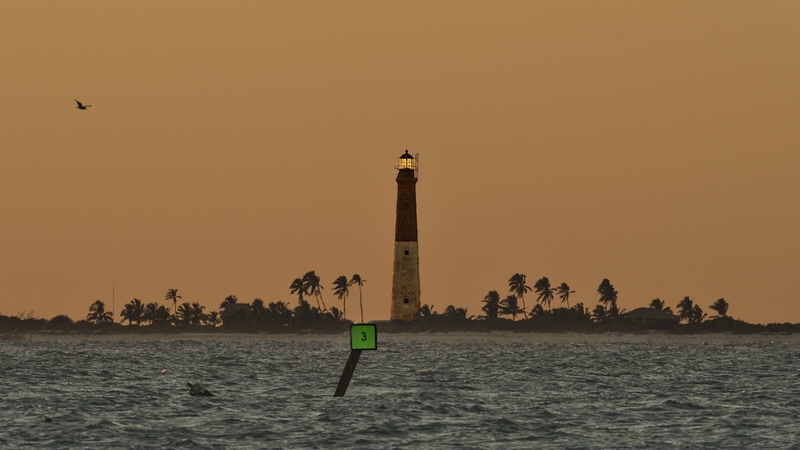 Read about the successful restoration of Loggerhead Key. National parks present unique opportunities for scientific research. Like other national parks, Dry Tortugas National Park serves as an ideal outdoor laboratory for a variety of scientific research activity. National Park Service managers need accurate information about the resources in their care in order to make responsible decisions about how they are managed. Specifically, they need to know how and why natural systems change over time, and what amount of change is normal, in order to make sound management decisions. In addition to a wide variety of research studies directed by park resource management specialists, other investigations involve research partnerships. The National Park Service emphasizes scientific collaboration and cooperation through partnerships with universities, non-governmental organizations, other federal, state, and local government agencies, and stakeholders. Dry Tortugas National Park also is one of seven parks encompassed by the South Florida / Caribbean Network, one of the 32 geographic networks that make up the National Park Service Inventory and Monitoring Program, which was launched in 1998 to build a stronger scientific foundation for the management and protection of natural resources across the country.